This gloriously self-indulgent deep dive is nearly over. 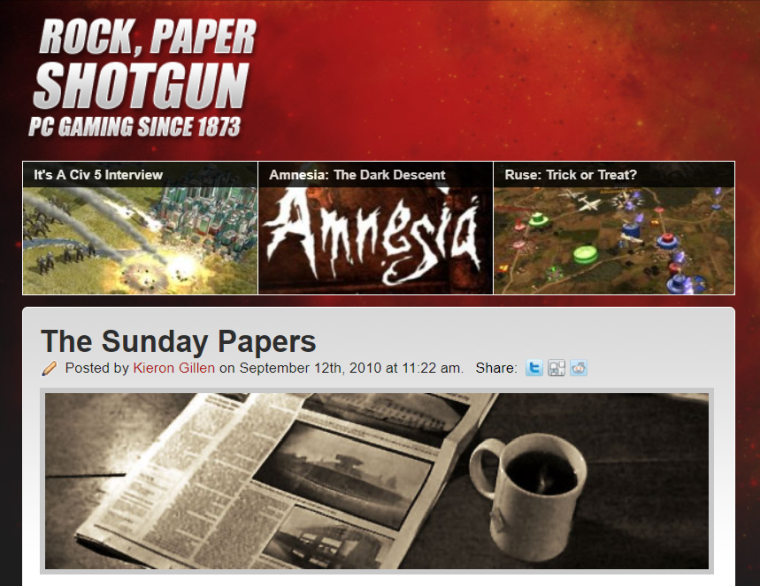 This is the fifth and final part of The Secret History Of Rock Paper Shotgun, an exploration of the first few months of the site based on the emails we sent at the time. You can read parts One, Two, Three and Four, and then dive in below. To finish, this is a more meandering exploration of our intentions and goals, achievements and failures, and a far too frank discussion of how we dealt with the financial side of the site. There are many more stories to tell about RPS’s journey over many years. Some of them amazing, some of them ugly to remember, but I shall spare you. Instead, let’s jump around in time over the first three years, thinking about our original goals, and how we set about achieving them. As discussed at length already, the primary purpose of RPS was to be something different in the universe of games coverage. And I think if there’s anything I’m more proud of than anything else, it’s that to describe how we were different is to describe how most games coverage works today. We didn’t want to be part of the process. We didn’t want to be at the behest of PRs, letting our agenda be set by theirs. We wanted to write about what we cared about. Or at least write in a way we cared about when we didn’t. We wanted to be interesting about interesting things, not just churning press releases into posts. We wanted to be personality driven, to let our voices be front and centre, to build relationships with the reader that made them want to come back to find out what happened next. And personally, we wanted to be in control of our own fates, in an industry where we’d spent too long being badly treated. A huge part of why we were able to get where we got was the enormous privilege we were blessed with, by time and circumstance. The reality was, we barely made a penny from RPS for over two years. That we were in a situation where that was even possible is impossible to over-value. I mean, I personally was scraping by, living on the edge of an overdraft, in a shared ramshackle house. But I was making a living outside of the site, with enough spare time to work on it. That’s privilege. I remember our first salary. It was £200 a month, each. And I cannot tell you how good it felt. It was paying half my rent! (2009, shared ramshackle house.) It was real actual money being generated by the website we had created from scratch. And, thanks to that crazy first deal falling through, we’d done it without ever borrowing money, without ever having debt. Which was pretty unique. 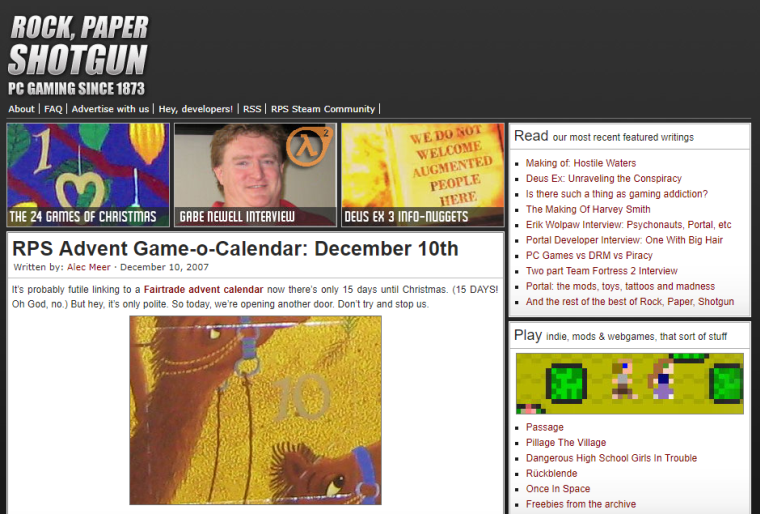 (The sad tale of Crispy Gamer, launched a year after RPS in October 2008, really highlighted this for us. It was a huge launch, a site headed up by people ex of Google, GameSpy and eMusic, having raised a mindblowing $8.25m in venture capital. Imagine us, struggling on a year in, good numbers but no money, seeing this launch as essentially a direct rival. They signed syndication deals; they hired from Wired and Entertainment Weekly; they had what might as well have been infinite money. And they made no impact at all, and all but died a year and a half later. 2009 was of course a horrible year for anyone trying to make money, but wow, what we could have done with eight million dollars! It was a sad time for all involved. Yet it emboldened us. We were succeeding, we had no board of directors that could lay us all off because they didn’t like the revenue, we were in charge. “Editorially, RPS is only getting stronger. We may have our squabbles, but we are producing great copy and we have one of the best communities on the web. We’re awesome, basically. But the four of us need to see cash return for awesomeness. “With this in mind, I think we should seriously consider returning to the Eurogamer deal. Reading through the emails over three years of prodding at this deal, I’m incredibly proud of our resilience in not just taking the first offer that made us money. We held out and held out, grew our traffic and reputation, while Jim worked his arse off getting us advertising deals that brought in decent chunks, until we were in a position to negotiate a deal much more in our favour. And here’s another source of pride: One of the things that would often happen in meetings is media companies would look at our stats, and just say they didn’t understand them. You see, and I’m bursting with pride to say this is still true today, RPS’s readership is on its front page. Which, it turns out, is incredibly unusual in this industry. Numbers, hits, audiences, are more usually built from SEO – a term that once only meant search engine optimisation. As in, traffic generated by incoming links from Google, Facebook, Twitter, Reddit, and so on. I believe colloquially this is known as “drive-bys”. It’s about creating buzzy headlines, coverage of games with the broadest possible appeal, such that people stumble on your site, read your article, then disappear away. But RPS’s readers turn up of their own accord. They read RPS because RPS is what they want to read. Sure, we get spikes from incoming links – in the early days I’ve been discussing these would come from Slashdot or Reddit. But we never relied on them. When it was ALL about Facebook, when every site was absolutely laser focused on getting those incoming Facebook clicks, I remember our sitting in the Eurogamer offices and being told off for not knowing if we had a Facebook account. That’s how terrible we were at this. And how brilliant we were for not needing it. We were. And we still are. RPS has always been different, even if the rest of the industry has caught up to a lot of what we set out to be. We have been much copied. Much improved upon, driving us to improve ourselves further. It is with some hefty arrogance that I believe RPS boldly led the way, on an internet that at the time was filled with blank-faced IGNs and GameSpys. Sites like PC Gamer’s and PCGN unquestionably and unashamedly copied our approach and design (the latter’s founders having previously spent so long sneeringly dismissing us as “Kieron Gillen’s blog” – you’re welcome) and surfed our early wake. And I think we broadened the scope of how people saw games journalism and criticism, to help direct the industry to a place where it now boasts wonderful sites like Waypoint, Cool Ghosts and Into The Spine. A core element of our earliest plan was to try not to distinguish games based on their budgets. RPS’s launch was serendipitous in many ways, with the advent of Steam’s rejuvenation of PC as a platform, alongside and interwoven with 2008’s true burgeoning of indie gaming. And while it was mostly good fortune (as Kieron puts it now, “Like a music paper forming at the same time as punk”), we were the right people in the right place to ride that wave. We were the loudest voices for a range of indie games in our early months (and beyond), and found we could bring significant attention to games we really valued. To pick a few more obvious examples, February 2008 saw us championing Audiosurf, in March Kieron went crazy for Trials 2: Second Edition, and come October we had the world exclusive review of World Of Goo. And we were making a difference. Developers, with whom we’d have had little or no contact before we went crazy about one of their games, would send us sales graphs, showing the huge spikes a post on RPS would cause. It would make us smile from ear to ear. 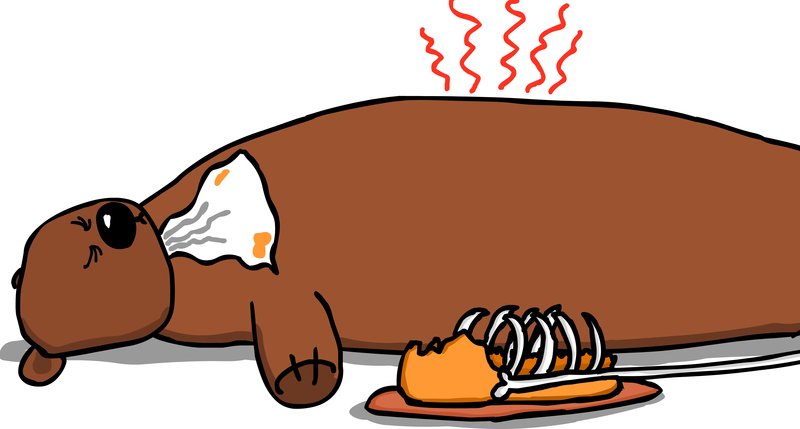 And we’ve gone this far without even discussing Horace The Endless Bear. Suffice it to say that he is your deity, and you’d better respect that. Kieron left in September 2010, overlapping with the marvellous Quintin Smith’s joining the site full-time. And that was, I’d suggest in hindsight, the end of RPS’s First Era. It’s undeniable that he was the Big Name when we launched, the one of us who was famous, the one of us who’d been such a pain in the arse as to have previously coined the term “New Games Journalism”. By the time he left, “Rock Paper Shotgun” was itself a name big enough to not need his any longer. I think he writes comics now. We made a ton of mistakes. We were never good at being bosses. But we tried our damnedest to not be the same as the bosses we’d had. The moment we started making money, we paid contributors. When we fixed our freelancer rates, we deliberately set them higher than anything we were getting paid elsewhere. When we asked people to write for us, we worked as hard as we could to help them find their own voices, not imitate ours. (The original contributor style guide I wrote included the line, “By ‘house style’ we mean the style of the house you’re currently in.”) We let people down, we launched people’s ongoing careers. We were always a mess, but we were mostly a good mess. This is, as I say, about those earliest days. So it misses out on naming and thanking so many people who’ve brought so much to RPS, from Quinns to Nathan to Adam to Alice0 as our first four hires, and then so many incredible people since, and of course the many wonderful freelancers along the way. A massive shout-out has to go to especially Tim Stone, who was with us from the very start, and is still with us now, and is the most dependable person in the industry. I’m not going to name everyone here, because I’ll forget someone. In those earliest days, it was Jim’s astonishing drive to see this succeed, Kieron’s reputation and passion for creating something to leave behind, Alec’s technical prowess and ability to write articles the whole internet wanted to read (locked doors, anyone? ), and my, um, willy jokes?, that saw us get started. Today it’s still about the collection of incredible voices and personalities embodied in the site’s new generation. RPS continues to be RPS, even without any of the four people who originally created it. That’s something for us, and them, to be incredibly proud.